Back in April I did a post about Canadian "clip-hop" duo KIDCITY, who at the time were preparing to to release their debut EP. Well, that EP has been out now since May and Kelly Ann and Caleb are now ready to release their new single, "Blackened." Their sound falls somewhere between Enya and Dr. Dre, coining it "clip-hop," drawing on "hip-hop and electronic heaviness." The duo remind me very much of the English 90s pop/electro duo Mono, who's trippy electro-ballad "Life In Mono" remains one of my favorite electronica tracks to date. KIDCITY mastered their own sound in the practice rooms at the University of Toronto, where they met and became friends. "Blackened" is available to download on KIDCITY's self-titled EP, which you can download on U.S. iTunes HERE. Those of you who happened to catch last season of Britains The X-Factor will surely recognize girl group Belle Amie. Originally a four member group (Rebecca Creighton, Esther Campbell, Geneva Lane, Sophia Wardman), Belle Amie was created after the girls failed to make it through as solo performers. As a newly put together group, Belle Amie did alright, lasting until the third week when they were eliminated. 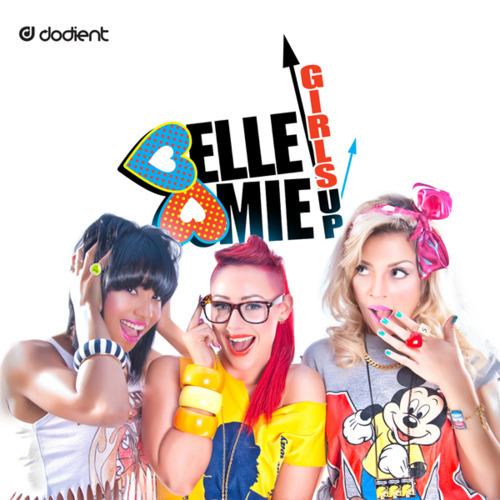 Since The X-Factor aired, Belle Amie lost a member (Geneva Lane), signed a record deal with Dodient Records and plan to release their debut single, "Girls Up" on August 7th in the UK. Quite the impressive turn around, ladies! As far as girl group singles go, "Girls Up" is fun. As a trio, Esther, Rebecca and Sophia hold their own vocally speaking, which I knew wouldn't be an issue. When watching them perform live on The X-Factor, there was no question that they were talented individuals, but there were shaky performances. At the same time, I'm no fool. I know how that there are a lot of...errrr....modifications that occur during the recording process. I knew that with the right producers, songwriters and creative team - Belle Amie could be a marketable girl group, it was just a matter of time. Well, seems like that time is now and I'm pretty happy with the results. Each girl has her own unique personality that comes through in the video for "Girls Up," which while not ground breakingly original (how many 'dolls come to life' videos are there?) is still a lot of fun. While I'm not sure how far Belle Amie will go, "Girls Up" serves as a nice introduction and could be the basis for a long career in pop music. Let's just hope their label doesn't squander their talent, UK radio takes notice and fans of The X-Factor buy their music. Buy "Girls Up" on August 7th in the UK and look for remixes by DJ Q, JME, Soulshaker, The Squatters and TM.